Deworming your cat is an essential part of being a good owner. Cats are susceptible to three types of intestinal worms: tapeworm, roundworm and hookworm. Whilst contracting these worms is not serious, if they are left untreated they can cause serious issues. Even healthy cats can have worms so do not wait for signs that your cat is unwell to worm them. Contracting parasites can happen from contact with another infected animal, therefore outdoor cats are more likely to contract worm infestations. It doesn’t necessarily need to be another cat; cats who hunt might come into contact with infected prey. The type of worms your cat is prone to will change throughout its life and its important that you are aware of these so you can choose the correct treatment. Young kittens are more likely to suffer with roundworms so it is important to worm them frequently. The recommendation is to treat them every two weeks from the age of 6-12 weeks. Older cats are more likely to suffer from tapeworms so they need to be treated with a drug active against both roundworms and tapeworms. The exact frequency of treatment depends on whether your cat hunts and whether it has fleas (fleas can become infected by taking blood from another infected cat). Generally speaking, you should treat your adult cat every two to three months with a drug that is active against roundworms and tapeworms, perhaps extending to six months for an indoor cat. Which Worming Products To Use? Bear in mind that the following are only some examples of symptoms that your cat has worms. To be sure that your cat is healthy, treat your cat regularly for worms. If your cat shows any of these symptoms it is essential that you take them to the vet. Seeking medical advice is always the best course of action for your cat to ensure that the infestation doesn’t spread further. 1. Age – If your cat is under 16 weeks then they are more likely to suffer from roundworms so the medication shouldbe active against these. 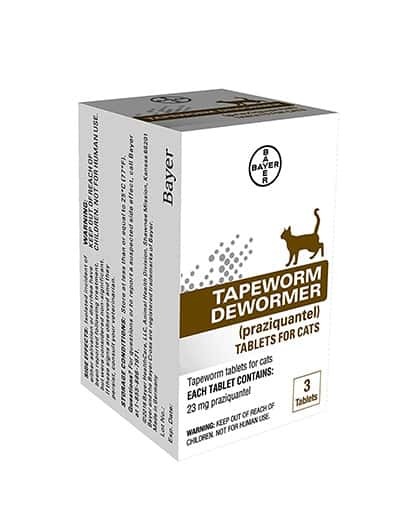 Over 16 weeks, your cat may also suffer from tapeworms so you will need to select a drug that is active against tapeworm and roundworms. 2. Dosage – As with people, the correct dosage wil depend on weight. You will need to weigh your cat, either at the vet or at home. At home, step onto the weighing scales yourself then step onto them with your cat and calculate the difference. The weight of your cat will determine the dosage you give them. If you have an overweight cat then you should consult your vet for the correct dosage. 3. Toxicity – Although most deworming products are safe, it is worth checking the ingredients of any product so that you don’t cause harm to your cat. If you have any doubts, consult your vet before administering any drugs. 4. Taste and Smell – This will probably affect how easy it will be to administer the dewormer to your cat. Some tablets can be crushed and added to food, although you might need to make an effort to mask the smell by mixing it in carefully. Try combining the pill with treats to encourage your cat to gobble it up. This product is a great choice provided that your cat is over 6 weeks old. One treatment removes tapeworms within 3 days. Some owners have expressed difficulty feeding their cats tablets, so it is useful that these tablets can be taken by mouth, mixed with food or crumbled. A lot of cat owners swear by these as a cost effective alternative to expensive vet deworming. Tablets are a god size for feeding your cat. They can also be crumbed and mixed with food. Only for cats over 6 weeks. This liquid dewormer has the distinct advantage of avoiding trying to force your cat to swallow a tablet. It claims that cats find it tasty and many owners agree, although some have reported that their cat didn’t seem to enjoy the taste and some even report their cat vomiting after eating it. 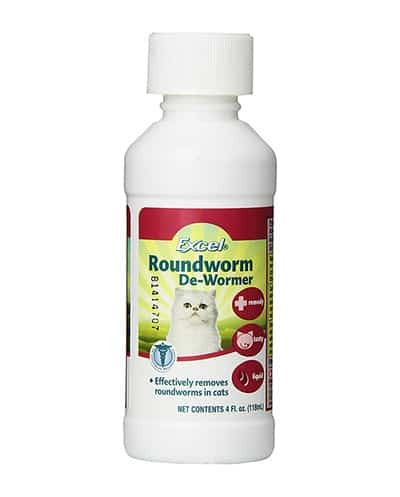 It only treats roundworm and cannot be used on cats under 6 weeks. Bottle doesn’t come with a foil seal, some leakages. 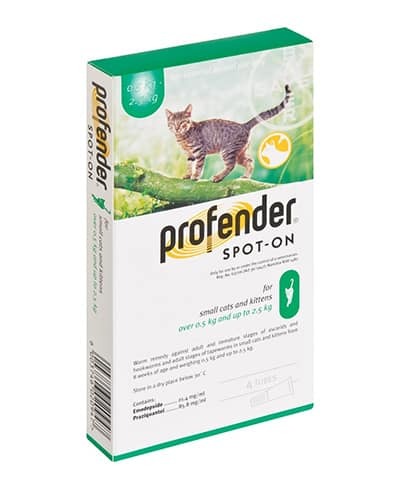 Profender is the first ever topical dewormer, meaning you can treat your cat for worms by applying the drug to its skin. It only needs one treatment to rid your cat of worms. There are three different products available from Profender, depending on your cat and its weight. It cannot be administered to kittens under 8 weeks. It treats hookworms, tapeworms and roundworms. The most important thing is to treat your cat regularly, ensure that you are administering the correct type and dosage of medicine, and to check with your vet before giving anything to your pet. It might take a little bit of trial and error to find a dewormer that is right for your cat, but don’t give up! Your cat will be happier and healthier once it is free from worm infestations.